Advocacy visit & Policy Dialogue on adoption of the National Strategic Plan of Action for Nutrition NSPAN with focus on Maternal Nutrition, Infant Young Child Feeding held in Adamawa state. Group Discussion was held with 3 young women from an Internally Displaced Persons (IDP) Camp in Yola who participated at the event with their children. The women appealed to government to provide nutrient-dense foods for their young children. The representative of HRH Lamido Adamawa, Alh. Saidu, stated the urgent need for inclusiveness and that all stakeholders must work together to promote Exclusive Breastfeeding and address all areas of malnutrition in the state. 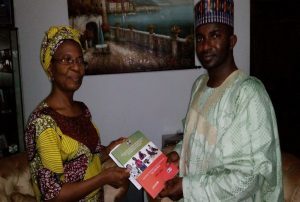 Advocacy visit was paid to Senator A. Nyako (Adamawa Central) with a presentation of the NSPAN document and a call for him to support adoption and implementation of the plan. CS-SUNN made a call to Adamawa state Government to: Domesticate the National Strategic Plan of Action for Nutrition (NSPAN, 2014 -2019) with focus on maternal and child nutrition; extend maternity leave to 6 months for working mothers, to protect Exclusive Breast Feeding; and provide maternal nutrition and IYCF services, through Health Facilities and Community based structures. Presentation of the NSPAN to Senator A. Nyako by CS-SUNN Network Coordinator Dr P Momah.